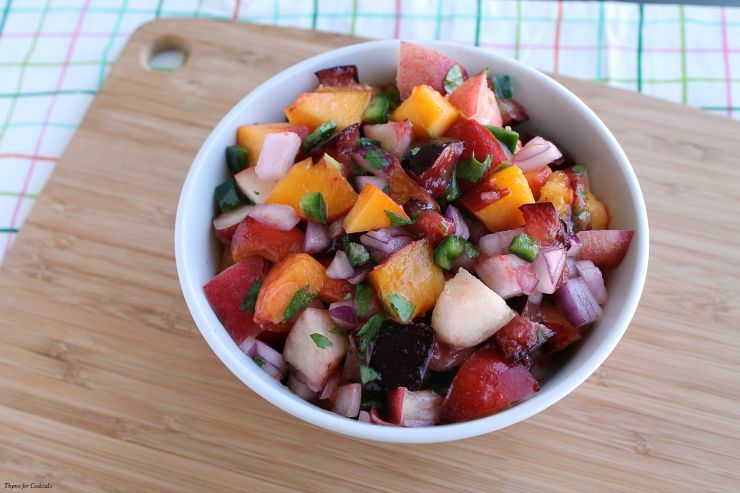 Give traditional salsa a makeover with this amazing Stone Fruit Salsa. Fresh peaches, plums and nectarines are mixed with spicy jalapenos, red onion and a hint of lime for a fruity Southwest treat. The casa crew absolutely loves salsa, I swear I make a batch every few weeks. We eat it on so many things! It might be a classic fresh salsa with lovely chunks of tomato goodness or a smooth, peppery blend like my Roasted Tomato Salsa. 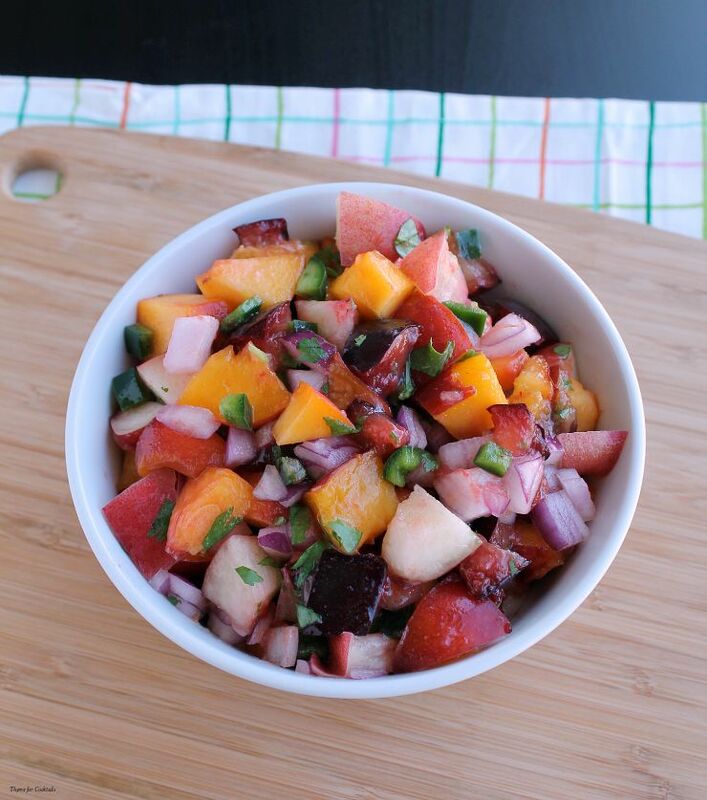 One of my favorites is the Peach and Tomato Salsa I made this summer! It really depends on what is in season and available at the farmers market. 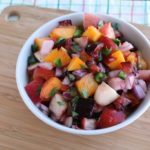 [bctt tweet=”Stone Fruit Salsa #salsa #fruit #spicy #southwest”] I love mixing fruit with spicy peppers, the combo goes so well with pork and chicken dishes. Stone fruits are coming into season but we still have triple degree temperatures in Arizona. I am ready for cobblers, pies and fruit crisps but the weather needs to catch up with me first. Once it is cool enough for the A/C to get turned off, I know it’s safe to start baking more! Since I’m not ready (willing) to overheat the casa kitchen, I needed a summer alternative. Enter the idea for salsa, why not chop up all those ripe, juicy stones fruits and put them together in a deliciously spicy mix? We are talking about the whole family too… white and yellow peaches, the same for the nectarines, plus a healthy dose of sweet plums. I have the best idea for a taco recipe that will pair perfectly with this salsa. 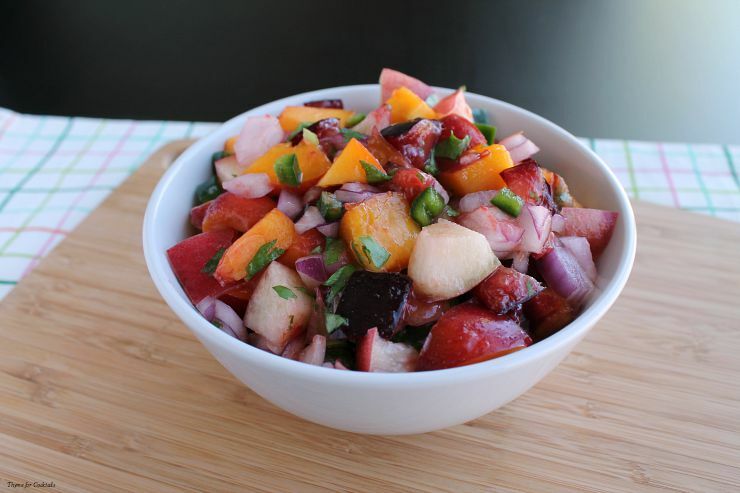 Stone Fruit Salsa has peaches, plums and nectarines mixed with spicy jalapenos and red onions for a fruity Southwest treat. Add all ingredients to a large bowl, stir to combine. Serve immediately.